The European controlled ICC is accused of targeting African countries while ignoring Western war crimes. 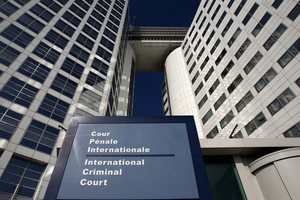 AFRICANGLOBE – African leaders have adopted a strategy calling for a collective withdrawal from the international criminal court. The non-binding decision came behind closed doors near the end of an African Union summit. A source close to the continental body’s legal council confirmed it, saying countries had been divided on whether to call for leaving the court individually or together. Some African countries have been especially critical of the ICC for pursuing heads of state. Sudanese president Omar al-Bashir has been wanted by the court since 2009 for orchestrating atrocities in Darfur. The ICC also caused an uproar among some African nations by indicting Kenyan president Uhuru Kenyatta on charges of crimes against humanity for 2007 post-election violence in which more than 1,000 died. The case collapsed because of what the ICC prosecutor called lack of cooperation by Kenya’s government. An obtained draft of the strategy, recommends that African countries strengthen their own judicial mechanisms and expand the jurisdiction of the African court of justice and human rights “in order to reduce the deference to the ICC”.